Entering the Pavilion one was struck by the long tables framing one side of the entrance, laid with hundreds of impressive terra cotta place settings. Tonight’s program was billed as a Grand Garchen Losar Feast and Chakrasamvara Ganachakra. It certainly seemed like a great feast was in store for all. At 7:30pm the 17th Gyalwang Karmapa took his seat on a low throne on the stage with a medium-sized Buddha statue behind and above him. Stage decorations consisted of a Losar chema arrangement to his right and a large ram’s head and another Losar chema arrangement to his left. The chema arrangements consist of ornate wooden boxes heaped with tsampa (roasted barley flour); fresh stalks of barley, wheat, and other grains; and butter sculpture offerings mounted on gold plaques. These arrangements symbolize prosperity and abundant harvests in the year to come and are standard Losar decorations in monasteries. A row of yellow stage lights beamed down upon the Karmapa, lending an air of majesty to the setting. The evening’s festivities took place in the context of a ganachakra, a tantric feast. This puja started right away with a ganachakra text written by the Eighth Karmapa Mikyo Dorje. The first part of the text was chanted before the entertainment began. On either side of the stage, large screens displayed the words of the puja. Then the stage lights shifted from yellow to blue, as the program segued from the puja to the evening’s cultural program. 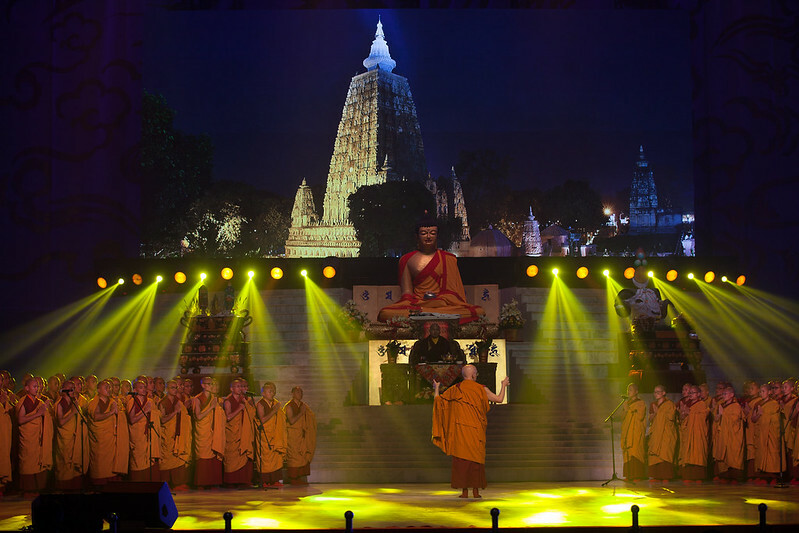 The central screen displayed a beautiful shot of the Mahabodhi Stupa. Soft music played in the background as a monastic choir filed on to fill the stage. 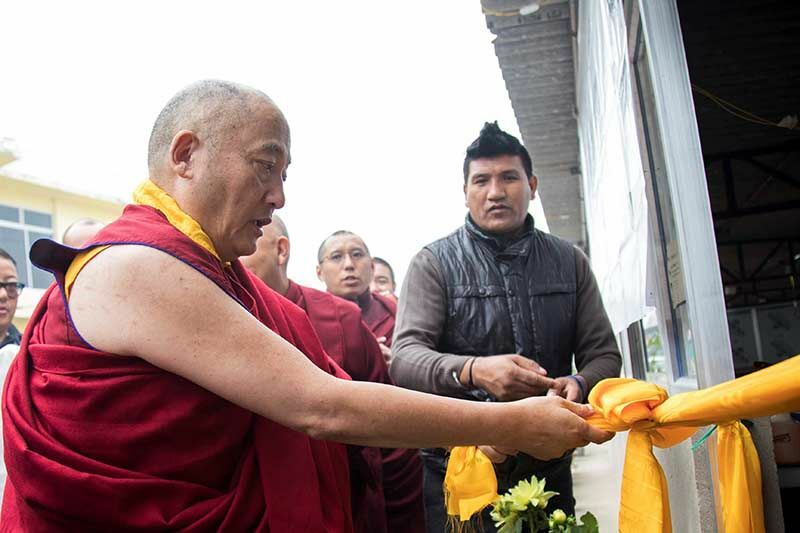 With Khenpo David Karma Choephel conducting, they performed a beautiful song of praise to the Three Jewels that His Holiness the Karmapa had translated from the Chinese. Afterwards, the two Master of Ceremonies dressed in finery, Ngodrup Tsering and Sherab Tharchin, took the stage to provide the context for the evening’s events and to introduce the performances. Meanwhile, scores of young Indian waiters in uniform white shirts and blue caps issued forth and formed rows to serve the delicious dinner to the audience. This service was carried out in an orderly and timely fashion so that over the course of the next hour, thousands of guests were served a resplendent meal, reminiscent of a five-star hotel dining experience. And garlands of lamps and incense. 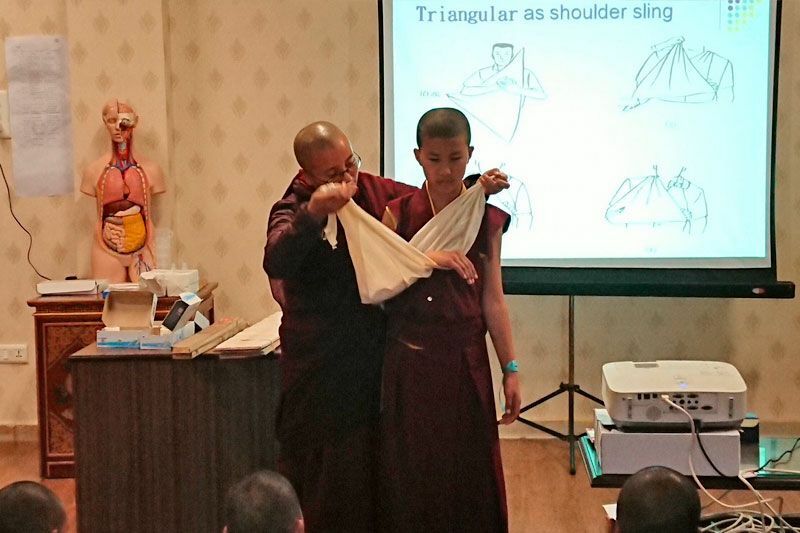 The first, from the birthplace of the Third Karmapa Rangjung Dorje, was a song called Tendrel Cho Yang, “A Dharma Melody of Interdependence.” This was performed by performers from the Tibetan Institute for Performing Arts (TIPA). On the video screens appeared the famous Tibetan singer Mr Yadung who sang Tendrel Yod, a song in praise of His Holiness the Gyalwang Karmapa. 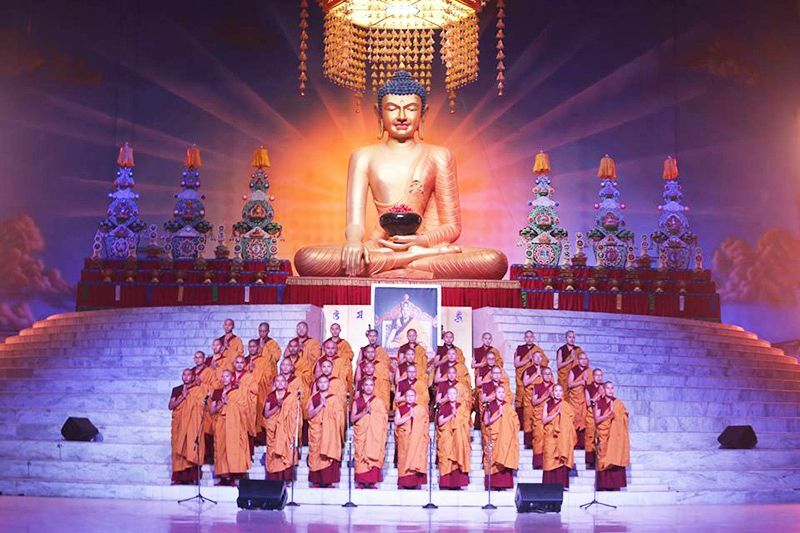 The song, Karmapa, an homage to the Gyalwang Karmapa was performed by another of Tibet’s famous singers Ms Lu Mo-Tsho. 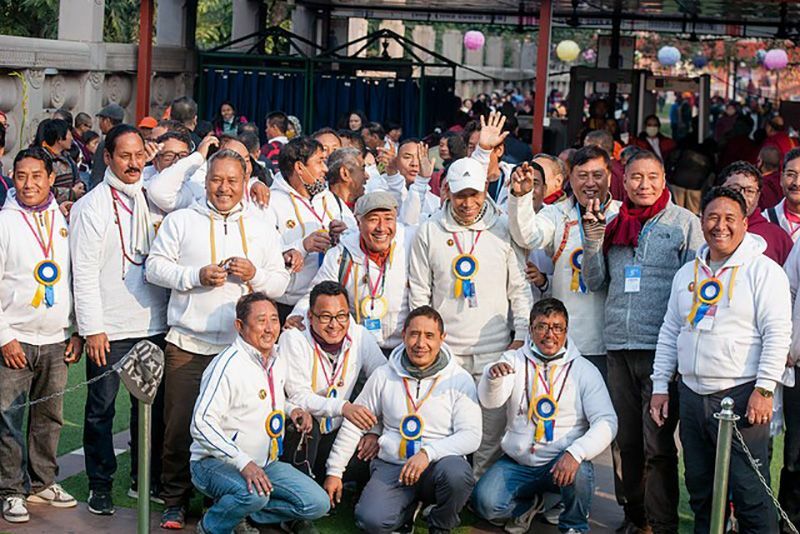 A Sikkimese song performed by men and women performers from Sikkim. Another video of a very well-known singer from the land of snow, Sherten-la performing his song, The Prince of Peace. A traditional dance from Arunachal Pradesh was performed by a group of young women and men from that region. Ms Rikdzin Drolma, another of Tibet’s famous artists, sang her song A Supplication of Faith, which is praise to His Holiness, the Gyalwang Karmapa. “Song and Dance of Central Tibet” performed by members of TIPA. Ms Tsewang Lhamo, another of Tibet’s famous singers, will perform her song, Words of Aspiration in Praise of the His Holiness the Karmapa. A traditional Bhutanese song performed by a group of performing artists from Bhutan. Mr Sherten and Ms Tsewang Lhamo performed a duet, another song of praise to His Holiness the Gyalwang Karmapa. The Great Drikpa Song of Tsang performed by artists from TIPA. Several of these were live performances and others were video performances projected on the two large screens each side of the Monlam stage. 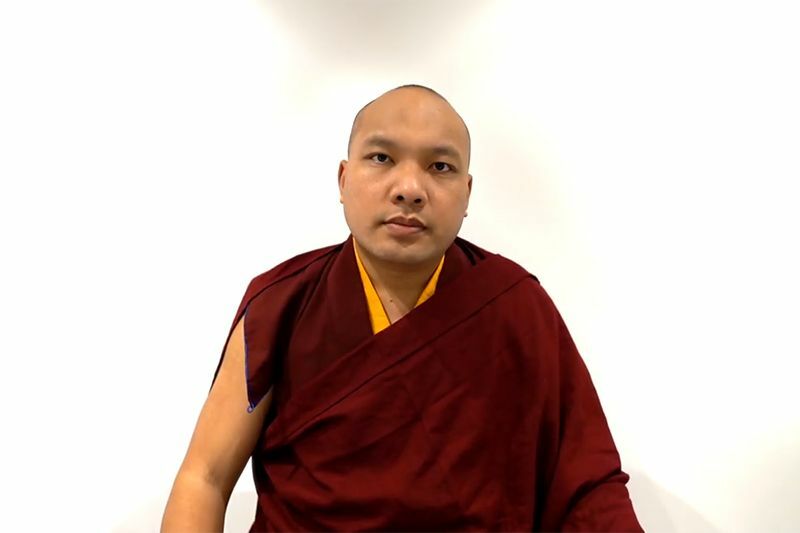 These moving spiritual music videos featured recorded footage of the performers singing interspersed with video clips of the 17th Karmapa granting blessings in a variety of settings, such as during large empowerments. At last, the time had come for the evening to wind down. This night of extraordinary enjoyments concluded with the ending verses of the Chakrasamvara Feast puja, followed by prayers of dedication and auspiciousness, after which, devotees streamed out of the Pavilion with happy hearts and full stomachs.